Nascent Recovery - What Does It Mean? What is a "nascent recovery"? What is the definition of a "nascent recovery"? If you have been watching the news lately, then you may have heard the term "nascent recovery" being used. Specifically, last week the IMF's (International Monetary Fund) chief economist declared that a "nascent recovery" in under way throughout the world. To understand what the term "nascent recovery" means, let's first define the term "nascent". "Nascent" means "born" or "beginning". 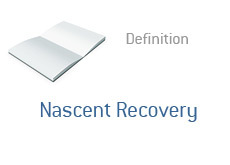 So, a "nascent recovery" refers to the beginning of a recovery. So, when the IMF's chief economist declares that a nascent recovery is under way throughout the world, he is actually saying that a recovery is just starting to take hold. As some people like to point out, declaring that a recovery might be beginning throughout the world can be rather tricky due to the amount of stimulus dollars that are still working their way through the system. How much of this "nascent recovery" is the result of stimulus spending and other existing programs meant to support the economy, and how much is due to an actual economic recovery starting to take hold?